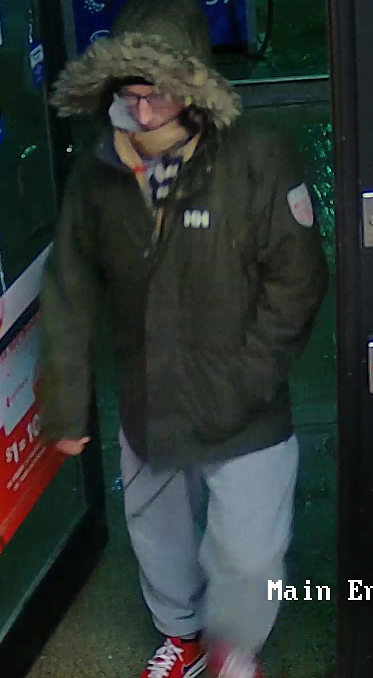 The Royal Newfoundland Constabulary (RNC) General Investigation Unit is seeking the public’s assistance identifying the man responsible for a recent armed robbery in St. John’s. On Thursday, April 4, 2019, shortly before 4:00 am, officers with RNC’s Operational Patrol Services Division and Police Dog Services responded to a service station on Newfoundland Drive in St. John’s in relation to a report of an armed robbery. Responding officers were informed that a man, armed with a weapon, demanded cash from staff. The suspect fled the scene prior to police arrival with an undisclosed quantity of cash. The suspect is male, wearing eye glasses and a green winter jacket with fur on the hood. Once inside the business he pulled a mask upon his face. The suspect is described as skinny, approximately six feet tall, and believed to be in his twenties. The RNC General Investigation Unit is asking that is anyone can identify the suspect to please contact the RNC. Anyone with any information on this armed robbery is asked to contact the RNC at 729-8000. If you wish to remain anonymous you can contact Crime Stoppers by calling 1-800-222-TIPS (TIPS is 8477), by Secure Web Tips by clicking the "Submit a Tip" button or by downloading our free and secure mobile app. Search your App Store for "P3 Tips" .Electronic tips submitted to Crime Stoppers are encrypted, entirely confidential and completely anonymous. You may be eligible for a cash reward. Burin Peninsula RCMP seeks the public’s assistance with respect to identifying a person of interest in the theft of a generator from a cabin in the Main Brook area. Sometime between April 6 and April 10, 2019, a person entered a cabin and stole a Champion 1200 W generator that was red and black in colour. If you are able to identify this person of interest, or have any information about this incident, please contact Burin Peninsula RCMP at 279-3001. If you wish to remain anonymous you can contact Crime Stoppers by calling 1-800-222-TIPS (TIPS is 8477), by Secure Web Tips by clicking the "Submit a Tip" button or by downloading our free and secure mobile app. Search your App Store for "P3 Tips" .Electronic tips submitted to Crime Stoppers are encrypted, entirely confidential and completely anonymous. You may be eligible for a cash reward. The Clarenville RCMP is seeking the publics assistance in solving a theft in Swift Current. Sometime between Saturday, August 25th, 2018 and Monday, August 27, 2018, a winch assembly kit and trailer guide posts were stolen from a Vantage custom boat trailer that was parked at Lester Eddy’s boat launch in Swift Current. The winch assembly kit is a heavy duty grade winch for heavier boats. If you know anything about this crime, please contact Clarenville RCMP at 709-466-3211. If you wish to remain anonymous you can contact Crime Stoppers by calling 1-800-222-TIPS (TIPS is 8477), by Secure Web Tips by clicking the "Submit a Tip" button or by downloading our free and secure mobile app. Search your App Store for "P3 Tips" .Electronic tips submitted to Crime Stoppers are encrypted, entirely confidential and completely anonymous. You may be eligible for a cash reward. On January 5th Ferryland RCMP received a complaint that a 2013 Polaris 800 Switchback had been stolen from Witless Bay Line near Witless Bay. The owner had left the snowmobile near Witless Bay Line after sustaining some damage from riding. The snowmobile was stolen between the hours of 1:30 and 5:30pm on the 5th while the owner went to get his vehicle to remove the snowmobile and bring it home. When he returned the snowmobile was gone. Anyone with information is asked to call Ferryland RCMP at 709-432-2440. To remain anonymous you can contact Crime Stoppers by calling 1-800-222-TIPS (8477), by Secure Web Tips at www.nlcrimestoppers.com, or by downloading our free and secure mobile app. Search your App Store for "P3 Tips". Electronic tips submitted to Crime Stoppers are encrypted, entirely confidential and completely anonymous. The Gander RCMP is seeking the public’s assistance in solving a theft from local business. If you have any information on this incident, please contact RCMP Gander at 709-256-6841. To remain anonymous you can contact Crime Stoppers by calling 1-800-222-TIPS (8477), by Secure Web Tips at www.nlcrimestoppers.com, or by downloading our free and secure mobile app. Search your App Store for "P3 Tips". Electronic tips submitted to Crime Stoppers are encrypted, entirely confidential and completely anonymous. 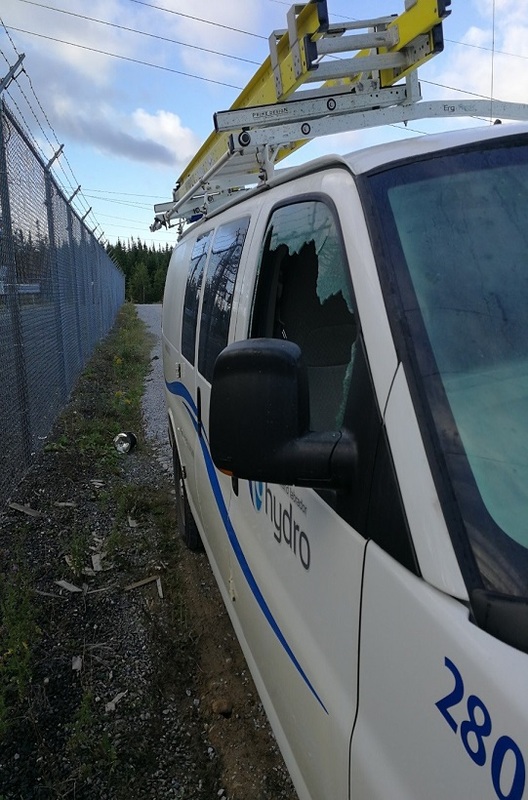 RCMP in Bonavista are requesting assistance from the public in identifying the driver of the vehicle that damaged the fence of a seasonal residence located on Skiffingtons Lane in Newmans Cove. The Grand Falls-Windsor RCMP is looking to identify a driver who picked up woman in Grand Falls-Windsor. Police believe that either late Sunday night, November 18th , or during the early morning hours of Monday, November 19th , a woman was picked up while walking near 13th Avenue in Grand Falls-Windsor by an unknown woman, who was driving a white coloured car. Grand Falls-Windsor RCMP is seeking assistance in identifying theunknown driver. Police ask if you were the driver or if you have any information please call Grand Falls-Windsor RCMP at 489-2121. To remain anonymous you can contact Crime Stoppers by calling 1-800-222-TIPS (TIPS is 8477), by Secure Web Tips by clicking the "Submit a Tip" button, or by downloading our free and secure mobile app. Search your App Store for "P3 Tips". Electronic tips submitted to Crime Stoppers are encrypted, entirely confidential and completely anonymous. The RNC are investigating two break and enters into Foodland at 1588 Torbay Rd. in Torbay. On Saturday, November 17, 2018, suspects broke the glass and entered the building and a quantity of merchandise was stolen. Video evidence shows possibly three suspects. One suspect was male wearing all blue clothing and a female suspect was wearing black with grey pants. A second break and enter into Foodland occurred on Friday, Nov. 23rd, 2018. A male suspect entered the store by breaking the glass and a quantity of alcohol was stolen. The male suspect was wearing gloves, dark clothing, a hoodie and sneakers. Anyone with information on this incident is asked to call the RNC at 729-8000. To remain anonymous you can contact Crime Stoppers by calling 1-800-222-TIPS (TIPS is 8477), by Secure Web Tips by clicking the "Submit a Tip" button, or by downloading our free and secure mobile app. Search your App Store for "P3 Tips". Theft of a Vehicle from O’Briens Trucking in Witless Bay. The Ferryland RCMP is seeking the public’s assistance in solving the theft of a vehicle from O’Briens Trucking in Witless Bay. Sometime between 7:00 p.m. and 8:55 p.m. on Thursday, October 18, 2018, it was noticed that someone had entered O’Briens Trucking and were rifling through the heavy equipment. 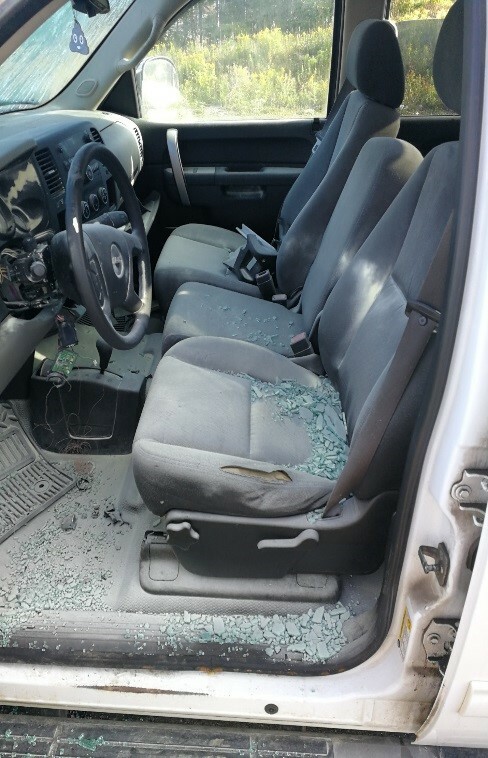 Upon further inspection, it was discovered a 2008 Chev Cobalt that was in storage was stolen. The vehicle was later located. If you know anything about this crime or can identify this person, please contact the Ferryland RCMP at 709-229-3892. If you wish to remain anonymous you can contact Crime Stoppers by calling 1-800-222-TIPS (TIPS is 8477), by Secure Web Tips by clicking the "Submit a Tip" button or by downloading our free and secure mobile app. Search your App Store for "P3 Tips" .Electronic tips submitted to Crime Stoppers are encrypted, entirely confidential and completely anonymous. You may be eligible for a cash reward. The Corner Brook RCMP is seeking the public’s assistance in solving a theft that took place at the Massey Drive Terminal Station. Sometime between 5:00 PM on Saturday, September 8, 2018 and 7:30 AM on Sunday, September 9,2018, there were 2 commercial vehicles and a utility trailer that were heavily damaged and rummaged through. 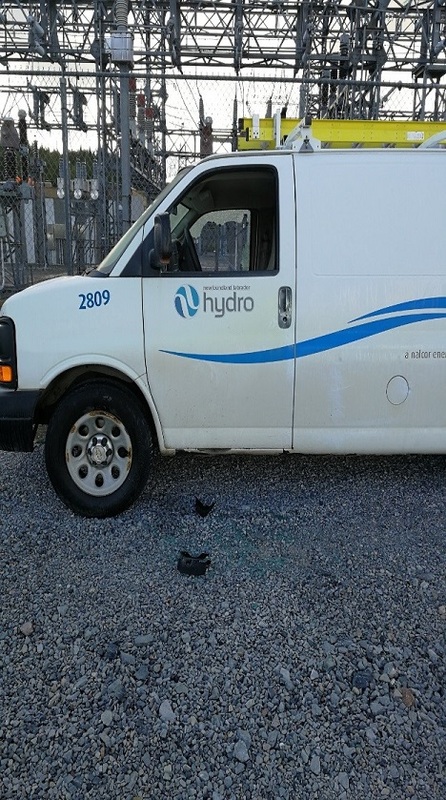 The suspect(s) gained access to the vehicles by breaking several vehicle windows and padlocks and stealing various contracting materials and equipment totalling an estimated value of $55,000. If you know anything about this crime or can identify persons involved, please contact the Corner Brook RCMP at 709-637-4433. If you wish to remain anonymous you can contact Crime Stoppers by calling 1-800-222-TIPS (TIPS is 8477), by Secure Web Tips by clicking the "Submit a Tip" button or by downloading our free and secure mobile app. Search your App Store for "P3 Tips". Electronic tips submitted to Crime Stoppers are encrypted, entirely confidential and completely anonymous. You may be eligible for a cash reward.